Nashville, Tenn. (Jul. 20, 2018) – Known for selling out arenas, multi-platinum selling artist TobyMac and his DiverseCity Band will embark on the unprecedented “TobyMac & DiverseCity Band: The Theatre Tour” with special guest Ryan Stevenson. Offering fans an unprecedented, intimate music experience, the rare 12 city run will traverse the east coast and Midwest including stops in Texas, Virginia, Ohio, Pennsylvania, Louisiana and more. His “HITS DEEP Tour” headlining run sold out 18 arenas earlier this year including Sacramento, St. Louis, Phoenix, Denver, Grand Rapids, Minneapolis and San Antonio, drawing 11,000 at Portland’s Moda Arena alone. Food for the Hungry is sponsoring the 12 city run, allowing fans a one-of-a-kind concert experience. Providing life-changing resources such as clean water, medical aid, food, equal educational opportunities to girls and boys, vocational training and empowerment in the midst of unimaginable hardships, Food For The Hungry has been fighting poverty through purposeful relief and development for over four decades. For more info on Food For The Hungry visit them online at FH.org. On Wednesday, the 7X GRAMMY® winner released an unexpected, brand-new track, “Everything.” The infectious tune was penned by TobyMac and will go for radio adds on Aug. 10. “Everything” follows “I just need U.” which marked TobyMac’s biggest single in six years soaring quickly to the top of the radio charts and Billboard's Hot Christian Songs Chart. 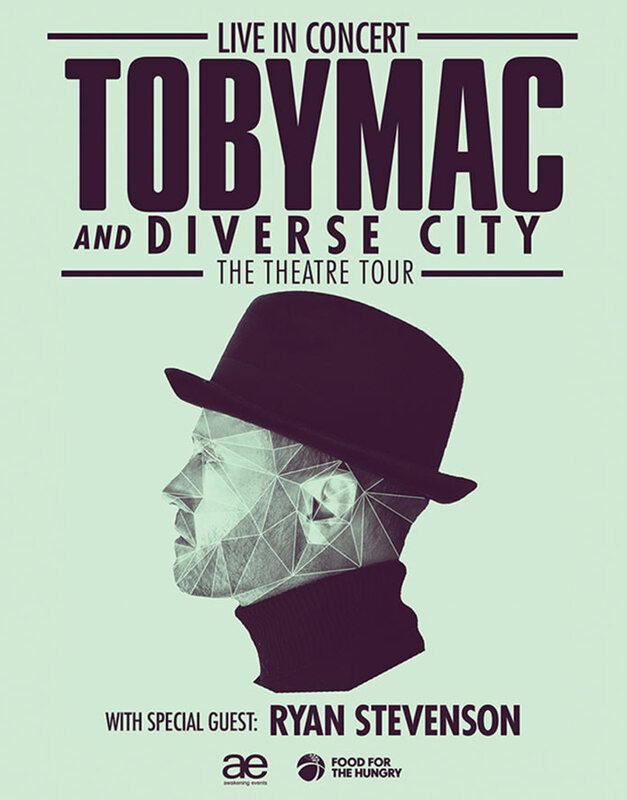 Tickets for “TobyMac & DiverseCity Band: The Theatre Tour” will go on sale Fri. Jul. 27. For more information, visit www.TobyMac.com. With more than 11 million units in career sales and a whopping seven GRAMMY® Awards, TobyMac's career continues on the fast track. His most recent RIAA Certified Gold studio album, THIS IS NOT A TEST garnered a GRAMMY® Award, Billboard Music Award nomination on top of a high marking debut at No. 4 on the Billboard Top 200. Each of his six studio solo projects have achieved Gold certification, a first for any artist in the history of his label, Capitol Christian Music Group. Among those honored with Gold certification, EYE ON IT, which debuted atop the Billboard 200, only the third ever Christian album to do so. His previous live DVD, ALIVE & TRANSPORTED, is RIAA certified platinum and received a GRAMMY® award. HITS DEEP LIVE, TobyMac's newest LIVE CD/DVD is available now along with the most recent holiday collection, Light Of Christmas. TobyMac's latest single "I just need U." was released in early 2018, and is his biggest single in six years soaring quickly to the top of the radio charts and Billboard's Hot Christian Songs Chart. TobyMac recently dropped an unexpected, infectious new track "Everything."